Exquisite, though simple in design. 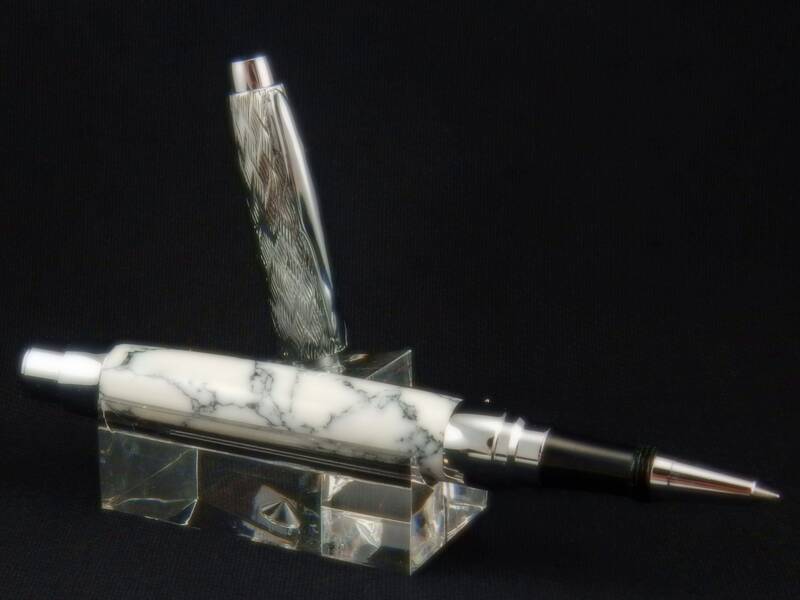 This Presimo rollerball has been turned from TruStone's White Turquoise, which has undergone a stabilization process allowing it to be worked in such a manner. As a rollerball, the pen accepts premium German ink refills, either Schneider topball 850 or Hauser bill 707 SF refills. A Schneider topball 850 is pre-loaded. Alternately, as a fountain pen, an upgraded Heritance nib is installed (available in either fine point or medium point). Both a pre-filled disposable cartridge (international standard size) and a refillable reservoir (often called a converter) accompany the sale. A 50% non-refundable deposit MAY BE required before work will commence on custom orders. Based on applicable state sales tax laws, Write Stuff of AZ charges sales tax for merchandise shipped to Arizona addresses. Additionally, city sales tax is assessed for items shipped to Tucson addresses. Write Stuff of AZ ships merchandise to a variety of locations, including internationally. Service most commonly used is USPS Priority with Delivery Confirmation. STOCKED ITEMS: Should you be less than fully satisfied with your purchase, send it back within 14 days of purchase for exchange or refund. Wrap the item securely and include a copy of the invoice/packing slip that came with your shipment. CUSTOM ITEMS: Should you be less than fully satisfied with your purchase, send it back within 14 days of purchase for exchange or refund. A 50% re-stocking fee applies to ALL custom orders. Wrap the item securely and include a copy of the invoice/packing slip that came with your shipment. We recommend that you insure your shipment in case of loss or damage in transit. Shipping charges are the responsibility of the buyer. NOTE: We do NOT accept returns on engraved items, either for refunds or merchandise exchanges. Refunds, exclusive of shipping, will be processed within 30 days after receipt.